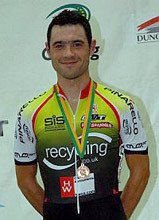 Great Britain had three current World Champions in this race: Chris Newton (also World Champion for the Points Race in 2002), Rob Hayles and Mark Cavendish. The race took a few laps to get going and in the early stages Rob Hayles was up there in the sprints, taking a few points in the first sprint and even trying to get a break going. By the time the race had covered 17 laps, the field was starting to line out, with small gaps appearing, the tell-tale signs that it was becoming tough for some of the riders. A break formed briefly, including Rob, and with it looking dangerous, Newton and Cavendish joined forces to bridge across to it. The race was now at full speed, and the pace saw a group of six or so riders tailed off and they soon got lapped by the large leading group which had come back together. There were still 90 laps to go at this point and a few laps later, Mark Cavendish found himself in a break of four trying to get away. Niki Terpstra was also involved - indeed he was in everything throughout the race! These four leaders were the first to lap the riders who had been dropped before and at the 80 lap to go point, Mark Cavendish scored the first of his two sprint wins and when the commitment of the four was called into question by Terpstra as the chasers closed in on the break, the Dutchman counter attacked straight away to get away alone. With 76 laps to go Chris Newton (pictured right) made a move, chasing the Dutchman, but it never came to anything and within a few laps, the race was back together, ready for the sprint at 70 laps to go. It was an amazing sprint for Mark Cavendish, who seemed to get squeezed as he led the sprint out, but he was still able to make room for himself to take the second of his two sprint wins. Another 10 laps and Newton was on the attack again but quickly caught by a Russian rider, then Terpstra and Finning of Australia made their way up to them. An Italian then joined them. They finally got dragged back with 36 laps to go, only for a new break to go almost immediately, once agin involving Newton. This break stuck and Newton got his lap: he now had to get some points to ensure a medal. This he did at the next sprint. It wasn't going to be easy though to keep the medal-winning position and Chris found himself chasing the race at times as riders let wheels go. He did however stay in control and after the final sprint had been decided, Chris had achieved his goal of a place in the Worlds with a bronze medal as the bonus. Mark Cavendish looked good throughout, had his moments in the sprints and finished a very respectable seventh, with Rob Hayles eleventh.